Between 31 December 2013 and 30 June 2017, the headline CET1 capital ratio across major UK banks increased from 10.1% to 14.3%. Using banks’ published data, we examine how much comfort we can take from this. Of the 4.2 percentage point increase, capital accumulation (mostly retained earnings) contributed 0.8pp – one fifth of the total. The bulk of the improvement came from RWAs reductions, adding 3.6pp – four fifth of the total. The RWA contribution can be divided into three categories. The main driver was deleveraging, contributing 2.5pp – three fifths of the total. 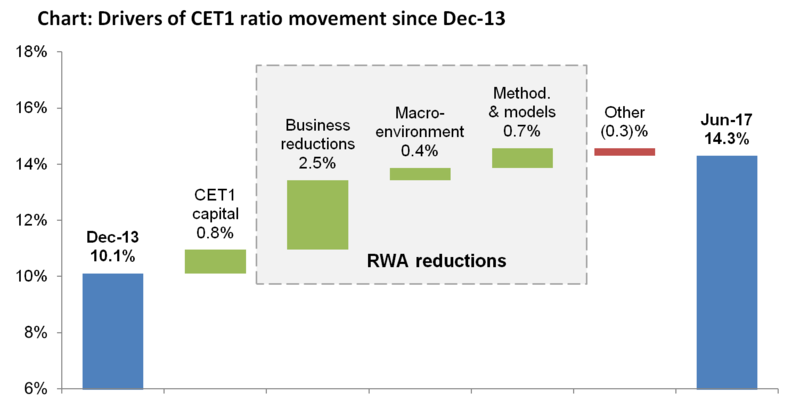 Banks also benefitted from a favourable economic environment, adding 0.4pp to the CET1 ratio – one tenth. Finally, the discussed M&M changes explain 0.7pp, one sixth of the improvement. For completeness, other factors include effects of foreign exchange movements. So we observe that underlying changes in balance sheets explain nearly 80% of the increase in capital ratios, while cyclical factors and RWA calculations only explain around 20%. Looking ahead, the fresh Basel III reform package and other recent changes will limit the possible effects of M&M changes, for example by reducing variability across risk-weights. James Cui and Marcu Pettersson both work in the Bank’s Banks Resilience Division. Next Post Bank of England and Financial Times Schools Blog Competition: Get writing! You insist with setting the risk weights based on the intrinsic risks of the assets, those risks against which banks take defensive measures (size of exposure and risk premiums). Instead you should look at the risk of the assets to the bank system, and where you can find that the safer an assets is perceived ex ante, the more dangerous it can be ex-post. I have just found out there is a term for this in psychology, namely “false safety behavior”.